The "inter-gender" main event between Ms Hustle and Nu Jerzey Twork has been announced as the second battle for the upcoming Watch the Throne 3 event from Queen of the Ring. 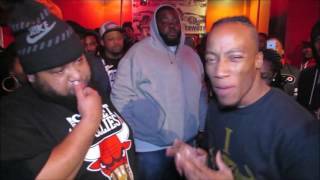 This will be Ms Hustle's return to battle rap in almost 4 years. Her last released battle was against O'ficcial at URL's Summer Madness 5 event in September of 2015. Also announced for the event is 40 B.A.R.R.S. vs. Couture.